Serving Arizona Divorce Papers: What Do You Need to Know? The first step in your Arizona divorce is filing the petition with the court and then notifying your spouse. Just calling up your spouse – or, in some celebrity cases, texting them – is not enough to notify them of the action. Proper delivery has to take place, in person, by a qualified professional, and proof has to be provided that service took place. If there is any delay in service, or if proof cannot be provided, the entire case can be delayed. For every delay you have, you will not only have to suffer more time married to a person you don’t want to be married to, but you will also pay more in legal fees. You may have to pay for more of your attorney’s time, and you may have to pay for paperwork to be refiled or service to be reenacted. If you are lucky enough to have a cooperative spouse who agrees to the divorce and isn’t looking for whatever way possible to make your life difficult, you can use service by acceptance. Under this method, you either hand over the divorce notice or mail it to the person along with a form called Acceptance of Service. Your spouse must then sign that form in the presence of a notary public or the court clerk. Obviously, this method will not work if your spouse is working against the divorce proceedings. Your spouse would just as likely throw the form in the trash or make a lot of claims about trying to get it signed while intentionally delaying or sabotaging the proceedings. If your spouse is abusive, trying to use this method could actually be dangerous. Perhaps you or your spouse have moved since your separation, so you can’t put the papers in their hands. You can use certified mail to send the notice and ensure that it arrives at the right location. Pay for “restricted delivery” so that the papers can be given only to the intended party and the person has to sign for their receipt. Otherwise, your spouse could claim that someone else accepted the delivery and it was lost. Again, using certified mail may not be appropriate if your spouse is being resistant. People can avoid the mailman, after all. If they know the papers are coming, they can just claim that they are someone else or deny that the person lives at that address. Also, if the signature is illegible, the court, in most instances, will deem the service of process invalid. If you have ever seen my signature, it would be invalid for sure. Sometimes, you may not know how to find your spouse. Maybe the person is eluding the law or just eluding you to avoid paying child support or spousal support. In these cases, you can serve notice through a publication in a local newspaper or magazine. However, using this method is considered a last resort as it is the least favorable way to deliver service. If you choose service through publication and your spouse does not respond, you should be prepared to show that you explored every possible route to find your spouse, including checking jails and hospitals, looking up directories, looking at social media, and even looking at obituaries. Service by publication can only be effected with a Judge’s order. The best way to get most court papers served properly is to hire a professional process server near Tempe. A divorce process server knows all the tricks that people use to avoid service of process and has their own tricks for overcoming these obstacles. A professional knows how to find the right person quickly and ensure proper process of service with proof. Hiring a Tempe process serving company is especially recommended if your spouse was abusive or will take measures to avoid the divorce proceedings in Tempe. The county sheriff (or a deputy) can also perform service of process, and you will have to pay a fee for the service. If you have financial hardship, you can apply for a fee waiver. The county sheriff will work in much the same way as a private process server. However, the sheriff won’t have as much motivation to get the job done if the person proves to be particularly elusive. If you have a really hard case, you might be better off with a private process server. In extreme cases, you can also serve the Office of the Attorney General, such as when the state is party to the case, like in child support matters, and your spouse cannot be found. In almost any situation, hiring a Tempe divorce process server is your best choice since the server has the experience and the means to find your spouse quickly and get the proof you need to move your case along. You will avoid delays and save money in the long run. In many counties, Deputies only serve during the daytime hours, and this is when people are less likely to be home. 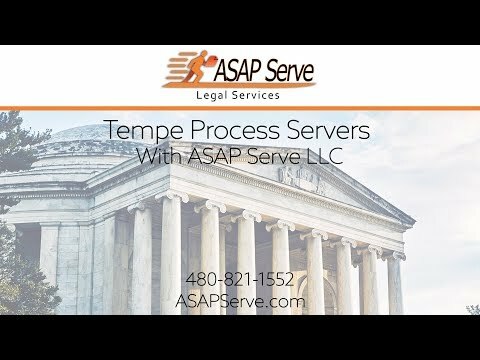 ASAP Service is a reputable process serving company in Arizona. We offer service of process for divorce cases, lawsuits, and many other matters. We have a simple three-step process that will result in you getting the service of process you need, on time, and with all the documentation to back it up. Call us in Tempe today to discuss your needs. Can an Arizona Process Server Deliver Papers to a Prison?